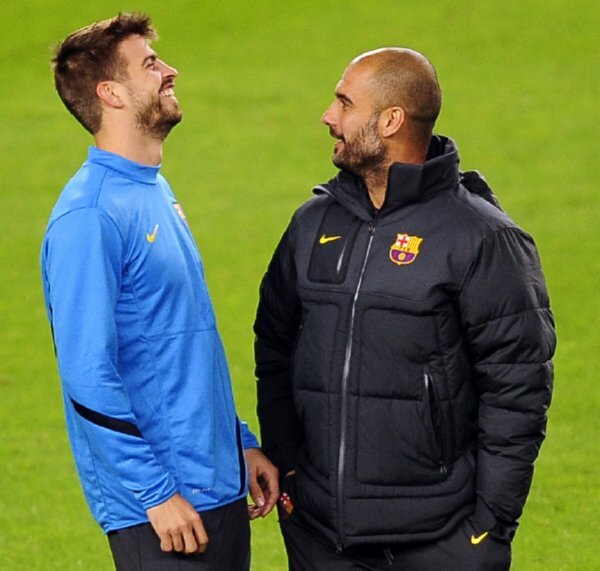 Word is going around in the Spanish tabloids that during his time as coach of Barcelona, Pep Guardiola may have hired a private detective agency to spy on known hell-raiser Gerard Pique when the Spanish centre-half first began dating his now-wife Shakira back in the spring of 2010. Tattle rag El Confidencial are reporting that Pep hired an agency called Metodo 3 to keep tabs on Pique in order to make sure he was “leading an orderly life” while dating the distinctly uncontroversial pop star. El Confidencial are claiming that a club source told them Guardiola and Barca’s director of external relations, Manel Estiarte, used the detective agency to follow several of their players whom they suspected were neglecting their professional duties while they were off the clock. It’s also being alleged that Barcelona’s spy tactics tie in to the decision to flog Deco, Ronaldinho and Samuel Eto’o between the summer of 2008 and the summer of 2009 – though, frankly, we find it hard to believe that a esteemed club like Barca would ever stoop so low as to spy on their own employees. The Barcelona love story is unraveling…..
Franck Ribery’s gonna have a hell of a time trying to explain to his new boss that the three underaged French prostitutes the detectives find are just massive fans of his.